Etymology: from the German word quarz (of uncertain origin). Distribution: numerous localities world-wide. In Bulgaria good crystallised examples from Smolyan District, Madan region; Eastern Rhodopes. Essential elements: oxygen (O), silicon (Si). Crystallography: trigonal — trapezohedral. 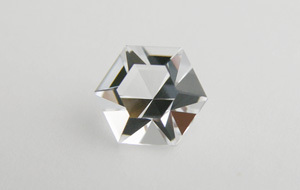 Crystal habit: widely variable; typically long prismatic with steep pyramidal terminations, but may be short prismatic to nearly bipyramidal; fibrous. Twinning: very common, penetration twins on the Dauphiné law, about , and the Brazil law, with  as contact plane; contact twins on the Japan law, with  as contact plane, may be repeated; and several other laws (Anthony et al., 2001—2005). Cleavage:  indistinct (Anthony et al., 2001—2005). Fracture: conchoidal (Anthony et al., 2001—2005). Tenacity: brittle, tough when massive (Anthony et al., 2001—2005). Hardness: 7 (Arem, 1987: 157). Density: 2.65 g/cm3 (Lazzarelli, 2012). Luminescence: may be triboluminescent (Anthony et al., 2001—2005). Other: piezoelectric and pyroelectric (Anthony et al., 2001—2005). Colour: colourless, white, grey, and many shades of violet, purple, yellow, orange, red, brown, pink, green, blue and black (Anthony et al., 2001—2005). Diaphaneity: transparent to nearly opaque (Anthony et al., 2001—2005). Lustre: vitreous, waxy to dull when massive (Anthony et al., 2001—2005). Refractive index: 1.544—1.553 — anisotropic [uniaxial (+)] (Arem, 1987: 157). Birefringence: 0.009. Dispersion: 0.013 (low) (Arem, 1987: 157). Pleochroism: quartz: none; amethyst: weak; citrine: weak; rose quartz: strong. 229 specimens: 0675 — 0.74 ct, no locality data; 0676 — 0.61 ct, no locality data; 0678 — 0.56 ct, no locality data; 0679 — 0.67 ct, no locality data; 0681 — 0.58 ct, no locality data; 0703 — 0.57 ct, no locality data; 0706 — 0.45 ct, no locality data; 0467 — 0.45 ct, no locality data; 0753 — 0.78 ct, Brazil; 0085 — 0.89 ct, Uruguay, Artigas Department; 0612 — 0.91 ct, Uruguay, Artigas Department; 0344 — 0.44 ct, Uruguay, Artigas Department; 0402 — 0.76 ct, no locality data; 0224 — 3.40 ct, Brazil; 0368 — 0.83 ct, no locality data; 0091 — 2.21 ct, Zambia; 0193 — 8.68 ct, no locality data; 0199 — 2.83 ct, no locality data; 0232 — 3.56 ct, no locality data; 0169 — 1.51 ct, Zambia; 0121 — 6.93 ct, Brazil; 0249 — 32.00 ct, Brazil; 0733 — 24.52 ct, Brazil; 0406 — 0.48 ct, no locality data; 0218 — 5.08 ct, Brazil; 0228 — 3.50 ct, Brazil; 0170 — 0.93 ct, Uruguay, Artigas Department; 0336 — 2.05 ct, Bolivia, Santa Cruz Department, Ángel Sandoval Province, La Gaiba, Anahí mine, 17.25°S 58.821°W; 0415 — 0.67 ct, Mozambique; 0702 — 0.60 ct, no locality data; 0683 — 1.53 ct, Brazil; 0226 — 1.29 ct, Mozambique; 0102 — 4.35 ct, Bolivia, Santa Cruz Department, Ángel Sandoval Province, La Gaiba, Anahí mine, 17.25°S 58.821°W; 0128 — 6.53 ct, Mozambique; 0208 — 3.19 ct, Bolivia, Santa Cruz Department, Ángel Sandoval Province, La Gaiba, Anahí mine, 17.25°S 58.821°W; 0299 — 5.72 ct, Mozambique; 0397 — 8.79 ct, Bolivia, Santa Cruz Department, Ángel Sandoval Province, La Gaiba, Anahí mine, 17.25°S 58.821°W; 0159 — 6.53 ct, India; 0161 — 6.17 ct, India; 0624 — 3.29 ct, Brazil; 0088 — 1.80 ct, Brazil; 0403 — 0.66 ct, Brazil; 0180 — 4.65 ct, no locality data; 0510 — 1.70 ct, no locality data; 0511 — 1.75 ct, no locality data; 0512 — 1.65 ct, no locality data; 0580 — 2.42 ct, no precise locality [Africa]; 0591 — 3.11 ct, no precise locality [Africa]; 0225 — 3.39 ct, no precise locality [Africa]; 0688 — 0.53 ct, no precise locality [Africa]; 0418 — 0.72 ct, no precise locality [Africa]; 0558 — 2.49 ct, no precise locality [Africa]; 0179 — 1.14 ct, no precise locality [Africa]; 0183 — 1.06 ct, no precise locality [Africa]; 0404 — 2.60 ct, no precise locality [Africa]; 0265 — 1.72 ct, no precise locality [Africa]; 0348 — 1.62 ct, no precise locality [Africa]; 0684 — 0.82 ct, no precise locality [Africa]; 0685 — 1.19 ct, no precise locality [Africa]; 0686 — 0.72 ct, no precise locality [Africa]; 0687 — 1.14 ct, no precise locality [Africa]; 0689 — 2.30 ct, no precise locality [Africa]; 0690 — 0.65 ct, no precise locality [Africa]; 0691 — 1.31 ct, no precise locality [Africa]; 0692 — 0.67 ct, no precise locality [Africa]; 0693 — 0.99 ct, no precise locality [Africa]; 0694 — 2.06 ct, no precise locality [Africa]; 0695 — 1.68 ct, no precise locality [Africa]; 0019 — 6.14 ct, no precise locality [Africa]; 0205 — 9.41 ct, Bulgaria, Haskovo, Stambolovo, Rabovo, 41.60905°N 25.64801°E, 185 m; 0468 — 0.73 ct, no precise locality [Africa]; 0619 — 3.92 ct, USA, Montana, Yellowstone River; 0620 — 3.78 ct, USA, Montana, Yellowstone River; 0119 — 4.42 ct, USA, Montana, Yellowstone River; 0124 — 4.37 ct, USA, Montana, Yellowstone River; 0382 — 2.04 ct, USA, Montana, Yellowstone River; 0371 — 2.57 ct, USA, Montana, Yellowstone River; 0372 — 2.68 ct, USA, Montana, Yellowstone River; 0392 — 2.64 ct, USA, Montana, Yellowstone River; 0393 — 2.53 ct, USA, Montana, Yellowstone River; 0324 — 3.95 ct, USA, Montana, Yellowstone River; 0325 — 4.02 ct, USA, Montana, Yellowstone River; 0611 — 23.20 ct, USA, Montana, Yellowstone River; 0258 — 0.98 ct, no precise locality [Africa]; 0419 — 0.38 ct, no precise locality [Africa]; 0111 — 2.70 ct, no precise locality [Africa]; 0112 — 3.00 ct, no precise locality [Africa]; 0250 — 1.43 ct, no precise locality [Africa]; 0321 — 2.60 ct, Brazil; 0322 — 2.25 ct, Brazil; 0696 — 1.04 ct, no precise locality [Africa]; 0317 — 1.61 ct, USA, Minnesota, Crow Wing County, Cuyuna; 0332 — 1.22 ct, USA, Minnesota, Crow Wing County, Cuyuna; 0743 — 2.45 ct, Madagascar; 0745 — 2.04 ct, Madagascar; 0010 — 4.68 ct, Brazil; 0552 — 1.65 ct, no precise locality [Africa]; 0553 — 2.15 ct, no precise locality [Africa]; 0566 — 2.05 ct, no precise locality [Africa]; 0474 — 4.10 ct, no precise locality [Africa]; 0270 — 3.46 ct, no precise locality [Africa]; 0394 — 1.34 ct, no precise locality [Africa]; 0537 — 3.69 ct, no precise locality [Africa]; 0554 — 2.68 ct, no precise locality [Africa]; 0582 — 2.91 ct, no precise locality [Africa]; 0471 — 0.59 ct, no precise locality [Africa]; 0020 — 6.61 ct, Botswana; 0021 — 6.56 ct, Botswana; 0215 — 2.29 ct, no precise locality [Africa]; 0216 — 2.31 ct, no precise locality [Africa]; 0610 — 6.08 ct, Zimbabwe, Mashonaland West, Makonde, Mutorashanga; 0107 — 0.52 ct, no precise locality [Africa]; 0292 — 0.51 ct, no precise locality [Africa]; 0697 — 0.49 ct, no precise locality [Africa]; 0473 — 0.61 ct, no precise locality [Africa]; 0181 — 2.59 ct, no locality data; 0182 — 2.53 ct, no locality data; 0465 — 0.61 ct, no precise locality [Africa]; 0600 — 18.55 ct, USA, Idaho, Owyhee County, Bruneau; 0627 — 15.92 ct, Mexico, Jalisco, San Cristóbal de la Barranca (north, on the Jalisco-Zacatecas border); 0724 — 2.07 ct, Mexico; 0725 — 1.53 ct, Mexico; 0323 — 2.65 ct, Mexico; 0065 — 0.80 ct, Brazil; 0569 — 2.40 ct, Brazil; 0413 — 0.82 ct, Brazil; 0004 — 5.89 ct, Brazil; 0367 — 0.56 ct, Brazil; 0609 — 1.13 ct, Brazil; 0184 — 1.32 ct, no locality data; 0244 — 1.27 ct, no locality data; 0568 — 8.50 ct, Brazil; 0375 — 1.06 ct, Tanzania; 0470 — 0.65 ct, Tanzania; 0712 — 4.80 ct, Tanzania; 0241 — 4.16 ct, Brazil; 0116 — 4.96 ct, Brazil; 0710 — 0.71 ct, Brazil; 0114 — 11.11 ct, Brazil; 0074 — 16.14 ct, Brazil; 0207 — 5.55 ct, Brazil; 0044 — 1.76 ct, Afghanistan; 0475 — 0.33 ct, Afghanistan; 0358 — 1.95 ct, Afghanistan; 0282 — 0.94 ct, Afghanistan; 0374 — 1.65 ct, Afghanistan; 0704 — 1.12 ct, Afghanistan; 0705 — 0.68 ct, Afghanistan; 0042 — 3.42 ct, Afghanistan; 0186 — 2.25 ct, Afghanistan; 0742 — 1.20 ct, no locality data; 0735 — 2.86 ct, no precise locality [Africa]; 0760 — 2.47 ct, Argentina; 0761 — 1.81 ct, Argentina; 0617 — 32.97 ct, Mexico; 0734 — 1.91 ct, no locality data; 0738 — 1.99 ct, no locality data; 0252 — 1.14 ct, Brazil; 0256 — 1.15 ct, Brazil; 0369 — 0.46 ct, Brazil; 0388 — 0.45 ct, Brazil; 0411 — 0.23 ct, Brazil; 0421 — 0.32 ct, Brazil; 0751 — 1.59 ct, Brazil; 0754 — 2.66 ct, Brazil; 0024 — 13.65 ct, Brazil; 0759 — 4.01 ct, Brazil; 0012 — 3.75 ct, Brazil; 0290 — 1.76 ct, Brazil; 0707 — 0.79 ct, Brazil; 0708 — 0.89 ct, Brazil; 0711 — 1.03 ct, Tanzania; 0217 — 1.19 ct, Brazil; 0661 — 2.72 ct, Brazil; 0408 — 0.52 ct, no locality data; 0379 — 5.21 ct, no precise locality [Africa]; 0589 — 5.02 ct, no precise locality [Africa]; 0172 — 1.98 ct, no precise locality [Africa]; 0291 — 1.40 ct, no locality data; 0316 — 1.56 ct, no precise locality [Africa]; 0189 — 2.42 ct, no precise locality [Africa]; 0752 — 11.03 ct, Brazil; 0758 — 19.19 ct, Brazil; 0420 — 0.47 ct, Bulgaria, Smolyan, Madan, Krushev Dol Pb-Zn deposit, 41.44577°N 24.93477°E; 0300 — 326.60 ct, no precise locality [Africa]; 0197 — 4.42 ct, no locality data; 0301 — 2.50 ct, Brazil; 0206 — 0.51 ct, Bulgaria, Smolyan, Madan, Krushev Dol Pb-Zn deposit, 41.44577°N 24.93477°E; 0303 — 1.85 ct, no precise locality [Africa]; 0304 — 2.50 ct, Bulgaria, Smolyan, Madan, Borieva [Reka]; 0680 — 0.13 ct, Bulgaria, Kardzhali, Krumovgrad, East Rhodope Mts, Yaraklitepe, 41.50262°N 25.644925°E, 444 m; 0709 — 0.27 ct, Bulgaria, Kardzhali, Krumovgrad, East Rhodope Mts, Yaraklitepe, 41.50262°N 25.644925°E, 444 m; 0191 — 1.36 ct, no precise locality [Africa]; 0246 — 1.70 ct, no locality data; 0539 — 5.71 ct, no precise locality [Africa]; 0616 — 5.70 ct, Bulgaria, Smolyan, Madan, Krushev Dol Pb-Zn deposit, 41.44577°N 24.93477°E; 0755 — 0.69 ct, Bulgaria, Smolyan, Madan, Krushev Dol Pb-Zn deposit, 41.44577°N 24.93477°E; 0762 — 0.46 ct, Bulgaria, Smolyan, Madan, Krushev Dol Pb-Zn deposit, 41.44577°N 24.93477°E; 0233 — 4.06 ct, Brazil; 0079 — 4.31 ct, Brazil; 0279 — 1.29 ct, no precise locality [Africa]; 0700 — 6.83 ct, Brazil; 0078 — 5.42 ct, Brazil; 0377 — 1.39 ct, no precise locality [Africa]; 0257 — 2.13 ct, no precise locality [Africa]; 0266 — 2.18 ct, no precise locality [Africa]; 0271 — 1.73 ct, no precise locality [Africa]; 0346 — 1.73 ct, no precise locality [Africa]; 0698 — 1.44 ct, no precise locality [Africa]; 0699 — 0.74 ct, no precise locality [Africa]; 0701 — 1.78 ct, no precise locality [Africa]; 0175 — 2.41 ct, no precise locality [Africa]; 0188 — 3.81 ct, no precise locality [Africa]; 0242 — 0.93 ct, no precise locality [Africa]; 0362 — 38.04 ct, Brazil; 0674 — 0.39 ct, Brazil; 0251 — 7.49 ct, no locality data; 0682 — 0.45 ct, Brazil; 0202 — 11.11 ct, Brazil; 0204 — 1.81 ct, no locality data; 0350 — 1.27 ct, no locality data; 0359 — 3.76 ct, Brazil; 0401 — 4.20 ct, Brazil; 0719 — 2.91 ct, Brazil; 0135 — 2.80 ct, Brazil; 0136 — 28.98 ct, Brazil; 0729 — 1.21 ct, no locality data; 0618 — 33.24 ct, no locality data; 0655 — 23.50 ct, Australia, Western Australia, Kimberley, Kununurra.